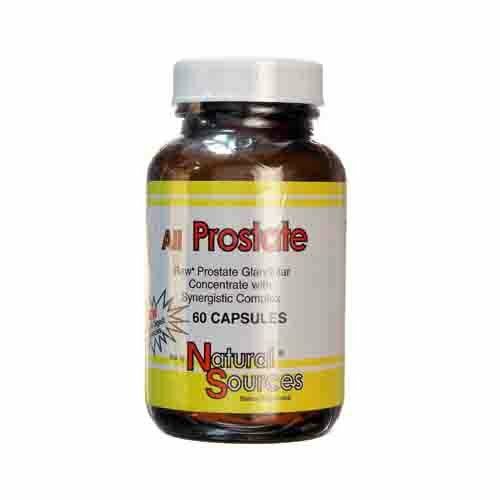 Natural Sources All Prostate Description: Ultra Raw Prostate is a glandular extract to support the prostate, a male reproductive gland that secretes a fluid that is a constituent of seminal fluid, which helps keep sperm healthy. Whole "raw" tissue concentrated from bovine sources specially processed (freeze-dried) at or below 5 C to preserve natural occurring vitamins, enzymes, nucleotides, lipoproteins and other cellular components. "Raw" tissue concentrates are made from toxin-free lyophilized glands imported from animals grazed on rangeland free of pesticides, growth hormones, antibiotics or chemical additives. Predictable sustained release formulation ensures maximum intestinal availability. Free Of Sugar, starch, preservatives, artificial colors, flavorings, corn, wheat, yeast, soy, milk derivatives. Disclaimer These statements have not been evaluated by the FDA. These products are not intended to diagnose, treat, cure, or prevent any disease.